Cisco WAN Quick Start provides reference and training for you, the candidate who is seeking your CCNA (Cisco Certified Network Associate) WAN Switching certification. Originating from Cisco Systems training material. 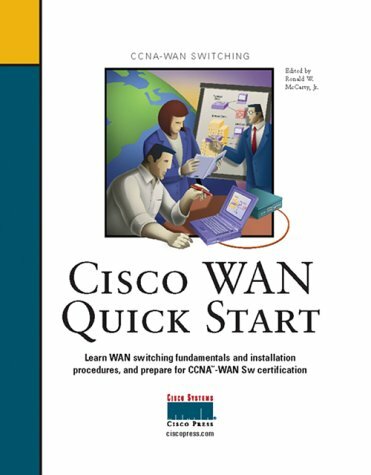 Cisco WAN Quick Start teaches the fundamentals needed by the networking professional who is beginning to work in a WAN switching environment. These fundamentals are then tested by Cisco Systems in their CCNA WAN Certification exam. As preparing for that exam, and also for job training, Cisco WAN Quick Start covers WAN switching essentials and the installation of Cisco WAN switches. The format for Cisco WAN Quick Start follows the design and outline of the Cisco WQS and ICWS courses. This book will supplement those two courses as well as cover much of the material you will need to learn if you do not have the time or resources to attend the courses. Self-assessment is provided by the addition of chapter-ending quizzes.